Endorsing an old, simpler method of disposition, the international Green Burial movement envisions a more meaningful, sustainable burial with minimal ecological impact. Pasture land adjacent to the north side of the historic Burlington Cemetery acquired in 2014 was designated as Green Burial Ground. The mandate of Green Burial (or Natural Burial) is to leave as small a footprint on the planet as possible. Customarily, the deceased is buried in a timely manner wrapped in a shroud or contained in a simple pine box. 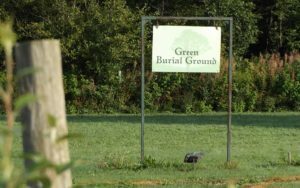 Following interment in the Burlington Green Burial Ground , the gravesite will not be mowed, allowing the area to naturalize and each individual burial site may be identified by a simple marker and/or indigenous tree. Although entirely optional, prior consultation with a licensed funeral director for assistance with personal decisions surrounding burial can contribute to one’s peace of mind and is a personal choice. The Death Certificate is usually signed by a medical doctor. A funeral director (acting as Division Registrar) obtains the information needed to complete the Death Registration form and files this with NS Vital Statistics prior to issuing a burial permit. Funeral Directors are the official agents of the government for carrying out this paperwork. A fee will be charged. Another alternative is for a person to drive to the NS Vital Statistics office in Halifax to obtain a burial permit once they have proof of death (the signed death certificate). If a funeral director is not involved with co-ordinating general details surrounding the burial, contact volunteer grounds manager Tom Metcalf 902-538-9759 or volunteer Board members Drew Armstrong 902-538-9851 or Brian Hirtle 902-538-7192 to arrange for the grave site to be opened & closed. A fee will be charged by the person who opens /closes the grave. Due to the health hazards of formaldehyde, if embalming, only green embalming fluid is permitted; this is available from a licensed mortician upon special request. Due to the large environmental footprint associated with cremation, cremated remains cannot be interred in a Green Burial. The deceased may be interred without a coffin, either unwrapped or covered with a natural fabric shroud/blanket (cotton, wool, etc) . If a coffin is involved, it must be totally biodegradable such as a simple wooden box, unvarnished and of biodegradable material (i.e., wooden fasteners or untreated iron nails). A sturdy cardboard coffin liner would also be acceptable. Individual gravesites may be marked with a standard stone marker and/or planting of an tree indigenous to the Acadian Forest as outlined below by the Cemetery Society guidelines. No other items can be left at the gravesite. The Cemetery Society will maintain an updated central registry of interments in the Green Burial Ground which will include details of the location of each deceased. A common marker located at the Green Burial Ground will identify those interred there ; specific locations of each deceased person will not be included on this common marker. The Cemetery Society suggests that you share with your loved ones your wishes and plans with regard to being buried in Burlington’s Green Burial Ground. Each gravesite may be identified by a low profile natural unpolished (rough) stone marker. 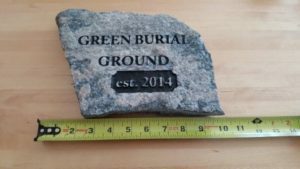 A recommended marker size is pictured; each stone marker should be within this size range to allow for mounting on a standard locally crafted iron bracket available from the Cemetery Society ($25). The purchase cost per Green Burial plot of $250 entitles ‘the right to be buried’ for one interment. This fee supports the care and upkeep of the cemetery; it does not ensure perpetual care. Contact Tom Metcalf, Grounds Supervisor at 902-538-9759 or Brian Hirtle at 902-538-7192, or Pat Kemp, Treasurer at 902-538-3387 for further information. Contributions to the historic Burlington Community Cemetery in general or in memory of a loved one are welcomed. The Burlington Cemetery Society, run entirely by volunteers, was designated a Charitable Organization in 2007, permitting CRA Income Tax deductible receipts for private donations. Donations can be sent to Pat Kemp, Treasurer at 3305 McNally Rd., Burlington, NS, B0P 1E0.